You might’ve thought a tattoo about a tiny grill couldn’t really get any worse, but Ariana Grande has somehow succeeded in making it happen. In case you missed the original story, and you’re wondering what this ‘tiny grill’ I’m talking about is, allow me to fill you in. Earlier this week, the singer shared a picture of a tattoo she’d had done in honour of her new song 7 Rings. 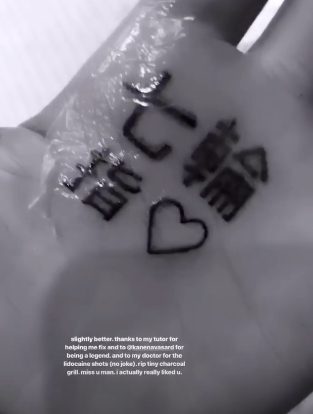 Presumably enjoying the intricate look of Japanese symbols, Ariana decided to have the title of her song inked in Japanese. However, the downfall of her plan was the fact she is, I assume, unable to read Japanese. Therefore it seems like she was unable to tell when the tattoo was horrendously misspelt. She posted the photo to her Instagram, where some of her 144 million followers were quick to point out that rather than 7 Rings, the tattoo actually translated to ‘Shichirin’, which means ‘small barbecue grill’. The 25-year-old swiftly removed the photo from Instagram, and in a since-deleted tweet admitted there were some symbols missing, claiming it simply hurt too much for her to get the whole thing done. Indeed, I left out ‘つの指’ which should have gone in between. It hurt like f**k n still looks tight. I wouldn’t have lasted one more symbol lmao. 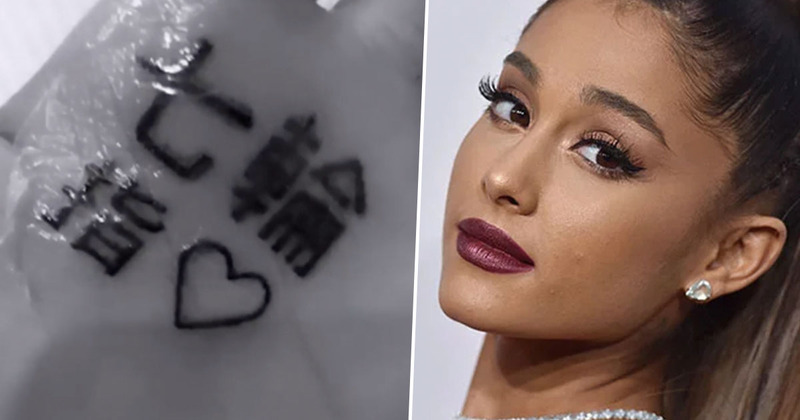 However, despite her claim that she ‘wouldn’t have lasted one more symbol’, Ariana actually did go back under the needle to add to her tattoo, suggesting she didn’t really know there were symbols missing the first time around. I think she was just trying to save face. Slightly better. Thanks to my tutor for helping me fix and to @kanenavasard for being a legend. And to my doctor for the lidocaine shots (no joke). Rip tiny charcoal grill. Miss you man. I actually really liked u. Unfortunately, as much as Ariana tried to make it work, the new symbols only made the translation even more unfortunate. Ariana’s had a nightmare here. Technically, the new tattoo is still not right. If you read it in the same order as the original one, it now says ‘BBQ grill finger’. The only way it would be correct is if she added a couple more symbols and rearranged them. But to be honest there was no way of fixing it. She would’ve been better off just getting it lasered off. ‘Barbecue grill finger’, followed by a love heart. It’s probably not what most people think of when they plan to get a meaningful tattoo, but it’s certainly unique. Well, Ariana explained herself that ‘this spot peels a ton and won’t last’, so hopefully she won’t be declaring her love for ‘barbecue grill finger’ for long. Hopefully she’ll learn from her mistake and have someone spell-check her tattoos in the future!